Seventh Heaven ... an artist’s impression. INSET: Work progresses on the development. A show apartment has been opened in Al Barari Firm Management’s Seventh Heaven development in Dubai, UAE, highlighting that true to its name the property offers heights of luxury and spacious airy interiors, thanks to the full-height glazing that all the rooms feature. Located in Al Barari estate, Seventh Heaven is an iconic building of 157 apartments comprising one- to four-bedroom apartments including some duplexes and four penthouses. Accessible from Sheikh Mohammed Bin Zayed Road, the project occupies the land adjacent to the nature reserve between the Al Barari residences and Green Works nursery, claimed to be the region’s largest privately-owned plant nursery. Some 80 per cent of the 18.42-million-sq-ft Al Barari development is made up of green space, beautiful themed gardens, naturally landscaped lakes and freshwater streams. 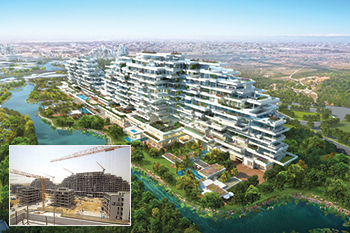 Construction work on the Seventh Heaven project commenced in September 2014 and is progressing on schedule, with completion targeted in the third quarter of 2017. The project is over 64 per cent complete and work has commenced on the internal finishes. The building, which has a total built-up area of 1.35 million sq ft, comprises a basement car-parking level and two podium levels consisting of 75,832 sq ft of retail and food and beverage (F&B) space. Rising above these are two separate apartment blocks – one of 11 storeys and the other with nine storeys – that taper towards the top to create an almost ‘luxury liner’ effect. The external façade features floor-to-floor aluminium double glazing with thermal block, plaster and paint infill areas. The building sits on a raft foundation with a traditional cast in-situ concrete superstructure using post-tensioned floor slabs. Each slab level has glass-reinforced concrete (GRC) slab edges creating a clear definition of each level in conjunction with the flying beams at certain locations. The flying beams give the building a distinctive appearance and bring some style and shading while helping moderate temperatures throughout the day, according to Crook. 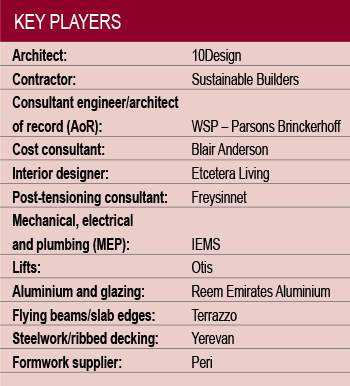 The flying beams are unique to Al Barari’s Seventh Heaven and Ashjar projects, he adds. Unlike most traditional multi-storey buildings, Al Barari’s unique apartment design features full-height glazing to all rooms in multiple aspects. “At the early design stage, studies of the movement of the sun around these buildings indicated that there were certain areas that would require special treatment in order to avoid direct sunlight penetration into the apartments. The concept architects, rather than trying to camouflage this component, took the decision to celebrate this unique requirement by making it a central piece of the buildings’ overall architecture. Hence, the flying beams were designed in such a way as to give definition to the buildings’ unusual shape. The flying beams, therefore, have a dual function of providing shading to strategic locations whilst at the same time creating a unique architectural component for the building,” Crook says. A colour scheme of white, purple, and grey-lilac creates a peaceful and relaxing atmosphere in the sitting area. “The key design features are the use of the natural light, the shape of the building and the terraces,” says Lesley Zaal, co-founder of the interior design company Etcetera Living, the design firm involved with Seventh Heaven. “As befits Al Barari, the residents can have the ease and convenience of an apartment with the added luxury of a beautiful terrace which can be developed into a wonderful outdoor living space. “For me, the design is spectacular and the advantage is that many of the apartments have uninterrupted views of Dubai’s skyline. The building will have two entire floors dedicated to retail spaces for restaurants, cafes, unique shops, with the added advantage of having access onto the landscaped waterways and gardens,” she says. A terrace at Seventh Heaven. Turning to the interiors, she says: “We have used the wall space to create display areas and additional storage. “For me, the large terraces are an added bonus to give the apartments the feel of a house rather than a flat, with plenty of space to create another living space with outdoor furniture, plants and wall features. The sitting area has a colour scheme of white, purple, and grey-lilac to create a peaceful and relaxing atmosphere. The tiles throughout this apartment are sourced locally while the wooden floors are from Europe. The kitchen units are by Siematic and the kitchen appliances from Miele. Sanitary ware is from Laufen, Bagno and Jaquar and floor and wall finishes are either marble or porcelain tiling. All apartments have full-height wardrobes with sliding door panels with the master bedroom featuring walk-in closets. Zaal points out that the work on the project is a team effort between Etcetera Living working hand in hand with the contractor Sustainable Builders. Al Barari has also launched the Signature collection comprising 13 units as part of the Seventh Heaven project. 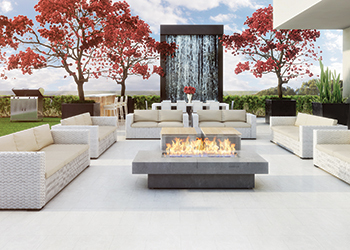 The collection includes four one-bedroom homes, eight two-bedrooms and a three- bedroom home. “Seventh Heaven Signature homes are the most spacious available in Dubai, starting from 1,700 to 3,300 sq ft,” says Crook. The Signature collection embodies all that is Al Barari, including high quality finishes, large living spaces and abundant natural light combined with contemporary design, and expansive terraces adding to the sheer open space of each home. The locations will offer spectacular views of the development’s famous landscaped gardens, surrounding walkways and bridges or the city skyline. All units have their own unique specific size and layout. Terrace sizes range from 270 to 1,640 sq ft and can be extended.